"I got a great discount from Agoda and only paid about $45USD..."
Have a question for Best Hotel? "Bfast provided and really clean." "Cleanliness, good location, and breakfast is great too." "The location very convenient, walk 15 minutes to Chihkan Tow..."
Offering quality accommodations in the sightseeing, restaurants, culture district of Tainan, Best Hotel is a popular pick for both business and leisure travelers. 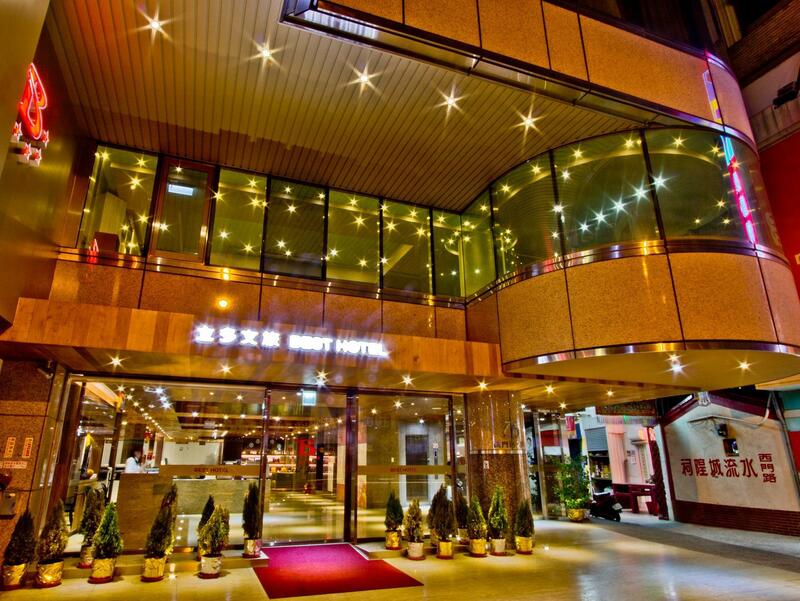 The hotel lies 26.8 km from the city center and provides accessibility to important town facilities. With its convenient location, the hotel offers easy access to the city's must-see destinations. The facilities and services provided by Best Hotel ensure a pleasant stay for guests. The hotel offers access to a vast array of services, including free Wi-Fi in all rooms, daily housekeeping, grocery deliveries, taxi service, 24-hour front desk. The hotel features 98 beautifully appointed guest rooms, many of which include television LCD/plasma screen, internet access – wireless, internet access – wireless (complimentary), non smoking rooms, air conditioning. The hotel's hot tub, karaoke are ideal places to relax and unwind after a busy day. Whatever your reason for visiting Tainan, the Best Hotel is the perfect venue for an exhilarating and exciting break away. Pros: easy transportation when the bus station is just across the road, breakfast is just perfect. I stayed here for four nights and they changed their breakfast menu everyday and it was just so good. Room is clean. Cons: I was staying in triple room at 12th floor for the first two nights. The toilet has some weird scent and I request to change room. The location very convenient, walk 15 minutes to Chihkan Tower, near the entrance there is bus stop no.88 and 99 to Anping Old Street, Sihcao Bridge, Taijiang National Park and Cigu Salt Mountain. Many souvenir shop and restaurant along the way back to hotel. Hayashi Department Store also nearby. Room very clean and all the staff are very helpful, even we don’t have many space to put our big luggage but we can manage it. its worth for just the short staying. Despite the cost of the stay, the breakfast was stupendous! The food selection is entirely local, but the quality of the food offered was far beyond what was expected. One dish even included authentic crab meat-for breakfast! I’ve paid far more and had gotten far less. There was even some fresh fruit offered in the room. Still, my room which had 2 single beds has got to be smallest I’ve ever stayed in at this price. Even the tiniest rooms in Hong Kong or Tokyo I’ve stayed were bigger! There was barely even enough room to walk. Still, the very clean and modern room, despite its minuscule size, was well equipped, even with a usable tub. The hotel also did not offer parking within the building and was a slight walking distance away. One note for foreigners: the hotel is located a bit far from the busy downtown area/train station (15-20 min walk) but surrounded by an endless selection of local delicacies. Still, the overall professionalism of the staff should be commended. My first visit to Taiwan and, at first, I thought may be not the best location, which proved wrong. A little distance from the main railway station, but quite far from the High Speed Rail station on departure, but for finding your way round, by foot or by taxi, it proved to be very good, for what I wanted to see, including things like shopping. All the services are what you'd expect in this country, including breakfast. Male member of reception staff, extremely polite and helpful, although not perfect English, but this did not cause any problems at all. All good! I got a great discount from Agoda and only paid about $45USD for a small room. The room was small, but was very clean, modern, and comfortable. The hotel staff was super friendly, too. I'll definitely stay again, it's more than worth it at that price. Good and comfortable sleep, quiet even though my room is opposite the elevator. Very nice breakfast! I have asked for a higher floor with a quiet room and was given a lowest n the noisiest room (close to the elevator). Design of the bathroom doesn't make sense. You have a shower curtain going round the toilet rather than the bathtub. You have a tub that doesn't have a tap/shower head. You have a stand shower that u can only use the hand held. Room is tight for 3 people. 4 will be worse. the male staff was rude when the hotel made a mistake in my booking. subsequently the other two female staffs helped to resolve the issue. good location though. is a boutique hotel, very good location, will definitely recommend to stay here. room is clean and very cozy. most of the attraction is walking distance. I wish the room can be bigger. We stayed in a 3 bedded room. The bed, pillow, toilet, etc are great! But there wasn't enough space for us to pack our luggage comfortably... breakfast can also improve with more warm / hot drinks since the weather was really cold when we were there. Staff was unable to assist to heat up drinks... but other than that, I love this hotel. The hotel location is very convenient to access all main sightseeing spots in Tainan. Staffs are nice. The room is clean, yet the bathroom is not very good. The washlet is so close to the bathtub that I cannot extend my knees while using it.